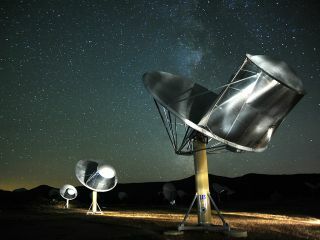 This photo of the Allen Telescope Array was taken by SETI astronomer Seth Shostak. The SETI (Search for Extraterrestrial Intelligence) Institute uses this array of radio dishes in Northern California to search for signals from a civilization beyond the solar system. Laurance Doyle is principal investigator for the Center for the Study of Life in the Universe at the SETI Institute, where he has been since 1987, and is a member of the NASA Kepler Mission Science Team. He contributed this article to SPACE.com's Expert Voices: Op-Ed & Insights. The Search for Extraterrestrial Intelligence (SETI) can be said to have begun in 1896 with the suggestion by Nikola Tesla (the designer of our modern, alternating current electrical system) that radio transmissions could be used to contact an extraterrestrial intelligent being. In 1899, Tesla actually did detect signals incompatible with, for example, terrestrial electric storms — but some have suggested, after looking at Tesla's data, that he might have been picking up "storms" on Jupiter (the Jovian plasma torus emits strong radio flux, making Jupiter a kind of miniature pulsar). Later, in August 1924, when Mars was in inferior conjunction (closer to Earth than it had been in over a century), the U.S. Naval Observatory imposed radio quiet for five minutes out of every hour at so that a dirigible equipped with a radio receiver could listen for any Martian signals. Frank Drake with a young observer at the Lick Observatory. The term R* — the number of good, or habitable, stars — usually means solar-type stars, but research over the past couple of decades has shown that smaller, red-dwarf stars can also be good locations for habitable planets. However, for planets from those stars to have liquid water, they must be at the right distance from their stars and tidally locked in rotation (one side of the planet always faces the star). Red dwarfs being 75 percent of the stellar population, those results have significantly increased SETI target stars. The term fp is the fraction of habitable stars that actually have planets. Since its launch in March 2009, the NASA Kepler telescope has actually determined the frequency of occurrence of planets of various sizes. It is a remarkable achievement and a very important one for the SETI efforts. At the SETI Institute, we have targeted and "listened to" all the detected planets that lie within a habitable zone. The primary goal of Kepler is to detect Earth-sized planets lying within the habitable zones of their stars. This is an ongoing process at the moment (and depends on the repair of Kepler's reaction-wheel gyro so it can point accurately). But finding an Earth-like planet in the habitable zone would give us the Drake Equation term ne, the number of planets that are Earth-like (in terms of size and location) within a given stellar system. The next term would be fl, the fraction of potentially habitable worlds where biology actually gets started. For this, detection would require a new generation of orbiting telescopes able to detect, for example, oxygen in the atmospheres of habitable planets, a sign of photosynthetic organisms. The first extraterrestrials to be detected might be forests; they have been around on the Earth for over 400 million years, while radio has only been around for a bit over 100 years. The next term is fi, the fraction of biological organisms that develop intelligence. This is the most difficult term of the Drake Equation to define. It raises more fundamental questions, like, "What is intelligence?" There are many kinds of intelligence, but for the purposes of SETI, it seems that this would mean communication intelligence, because this is what humanity would likely encounter — i.e., a communication. Similarly, it seems to me, if one wants to detect non-human communications from space, one should start studying the multitudinous non-human communication systems here on Earth. All animals (and plants, too, for that matter) communicate. But how do scientists analyze and determine the complexity of these communication systems (assuming, for now, that communication intelligence can be measured by message complexity)? Can researchers determine how complex these communications are? A tool for measuring message complexity lies in a mathematical field developed initially to measure how much information is transmitted through telephone lines, and it is called information theory. This discipline was developed by Claude Shannon of Bell Laboratories in 1949 and is used extensively today — for example, if you have zipped or unzipped a mailed file you (or your computer, anyway) used information theory. With colleagues Brenda McCowan and Sean Hanser of the University of California, Davis, we decided to apply information theory to bottlenose dolphin communications to see how much information they were transmitting to each other using their whistle communication system. That information amount depends on the distribution of the signal frequencies-of-occurrence and is called the information entropy. It turns out that Zipf's Law appears to describe a distribution of signals that is necessary to make a language. However, it is not a sufficient characteristic, as other processes canproduce this –1 slope, as well. We did a Zipf plot for bottlenose dolphins and got a –1 slope. This meant that their whistle communication system could contain complicated relationship rules within it (what linguists call "syntax" in human communication systems). It turns out that the Zipf slope for baby babbling is a lot less steep than Zipf's Law, but when baby dolphins were born at the facility where we had recorded the adult dolphins, we recorded them and found that the distribution of their whistle frequencies was the same as baby humans. We see both growing into their –1 language use. This meant that baby dolphins "babble" their whistles when they are little and learn their language as they mature. We also applied these techniques to humpback whales, in part because they are also a socially complex species, and in part because they rely — as the dolphins do — on vocal communication more than gestural or facial expressions. This species also had a global communication system millions of years before humans did. These animals also resembled humans in they way they dealt with noise. When one is talking on a phone line with static (or "noise," as engineers call it), the speaker has to slow down the rate of words in order to insure that the listener gets all the words. We also found this to be the case for humpback whales in the presence of boat noise — they slowed down the rate at which they transmitted signals to each other. They were communicating to each other while making bubble nets to trap herring. We could calculate how much the whales would have to slow down to compensate for the boat noise, but it turned out that they only compensated by about 60 percent — in this case they did this by increasing the total time they used to transmit signals to each other (i.e., they slowed their speech). We realized that the humpback whales must also have a kind of "syntax," because they got the gist of the message without having to hear it all the way through. We don't yet have enough data to determine if the information entropy (complexity or "rule" structure) is as high as ninth-order entropy, as is the case with humans, but we do know that whale signals have "condition probability" between them. This is a technical way of saying that these animals have structural complexity in their communication system. I've also applied information theory to a one-way communication between cotton plants and wasps, the cotton plants telling the wasps on which plant to land (the plants that have the worms the wasps are targeting). This is not an inter-world communication but perhaps as close as scientists can currently get, an inter-kingdom (plant to animal) communication system. I think it would be interesting to apply information theory to honey bees next, as their waggle dance communication system involves using the sun for navigation. Bees have the three important ingredients necessary to be identified by a SETI analysis — a communication system, tool use (building the hexagonal hive structures) and astronomy (they use the sun and sometimes the full moon to find honey sources). In addition to radio searches, optical SETI is now becoming more widespread. Radio SETI is looking for narrow-band transmissions (where one can turn the dial of the radio once and be on a new station), which nature apparently cannot produce. Optical SETI, however, relies on the detection of nanosecond pulses of light. Again, technology can produce such signals, but, as far as scientists know, nature cannot (the quickest pulses in nature may be millisecond pulsars). Would an advanced civilization use nanosecond optical (or infrared) pulses to signal over interstellar distances? It might, especially if it has a nice laser handy in its solar system. In the Earth's solar system, there is actually a naturally occurring microwave laser, or "maser," in the atmosphere of Mars. That planet's atmospheric carbon dioxide regularly "mases" with input from the sun. The upshot of this is that if one surrounded Mars with mirrors to focus this natural masing action, one could indeed send interstellar signals, essentially for free. Humanity's own civilization needs a few more decades (or maybe a century) before it could utilize this method of communication. But a new SETI idea is even farther out than that. The idea is that there is a SETI-type "calling card" in the human genome. In order for this to be isolated, one would have to show that this particular region in the human (or perhaps another species') genome was not just non-random (any process with a rule structure of any kind is non-random), but that this certain region of the genome was incompatible with the processes that shaped or altered the present genome. The idea is that if a region of the human genome could be shown to not be like any other parts of the genome, and — much more difficult — to not be producible by natural selection, for example, then it would have to have been made by a pre-human and very advanced intelligence. I think information theory here would be very useful, as one could perhaps isolate regions of the genome that had unusual structure. When pondering SETI efforts, one must consider what very advanced civilizations might be doing. One can hardly, therefore, avoid the latest in information transfer — quantum teleportation. So far, research in quantum optics laboratories has shown that information can (it appears) be instantaneously teleported over arbitrary distances. But it should perhaps be said, more precisely, that "quantum information" can be instantaneously teleported arbitrarily far away, because one must then use a kind of "key" to unlock the information. And the key cannot be transmitted faster than the speed of light. Nevertheless, one wonders if the first SETI message is going to come from space, or appear in one of our quantum computers. The search for extraterrestrial intelligence is a fascinating field and encompasses the whole gamut of disciplines, from astrophysics to animal communications, and from paleontology to quantum mechanics. At present, it is symbolized by a radio telescope, but that's just the tip of the iceberg. In a book on life in the solar system called "Other Worlds Than Ours" published in 1870, a British gentleman named Richard Proctor highlights a seventeenth century French work called the "Plurality of Worlds" and discusses the habitability of other planets. He stated that most of the public's interest in astronomy derives from its interest in finding life in space. I don't think this has changed.